Other than wine my main interest is horse racing and I couldn’t help feeling a similarity as I toured the vineyards at Mas Coutelou this morning. The trainer has prepared his charges to the best of his ability throughout the year, faced up to problems of weather and disease, been up all night tending them and must now carefully select when they are at their peak for the big challenge ahead. Meanwhile his assistants and stable hands gather together, friends old and new to lend a hand to the master and to learn from him. OK, maybe I am getting carried away. 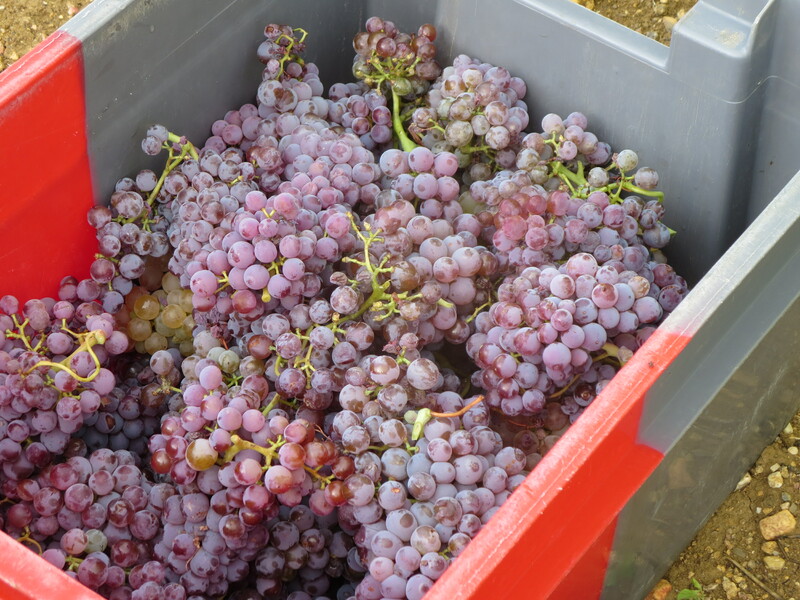 However, there is a feeling on the eve of my 4th vendanges of excitement that the race is on to bring in the best possible harvest from the grapes. Through winter, spring and early summer all went well, the rain came, the sun shone, the vines grew well. Latterly there have been setbacks it must be said. There has been next to no rain since June and the ground is once more parched. Some of the vines are stressed and their sap has lowered. This means that instead of concentrating energy into the grapes and ripening them fully the vines are protecting themselves. That is a real shame as everything was set for a top class vintage, now we have to wait and see what the next few weeks bring along. Rain is currently absent from the weather forecast, let’s hope that the meteorologists are mistaken. That said as I toured the vines I was impressed by the quality of the grapes. Yes the vines look tired, they should at this time of year as they ought to be giving everything to the fruit rather than the plant. The grapes though look healthy, big bunches in the Carignan vineyard (above) for example though there is still some greenness in the juice and the pips. 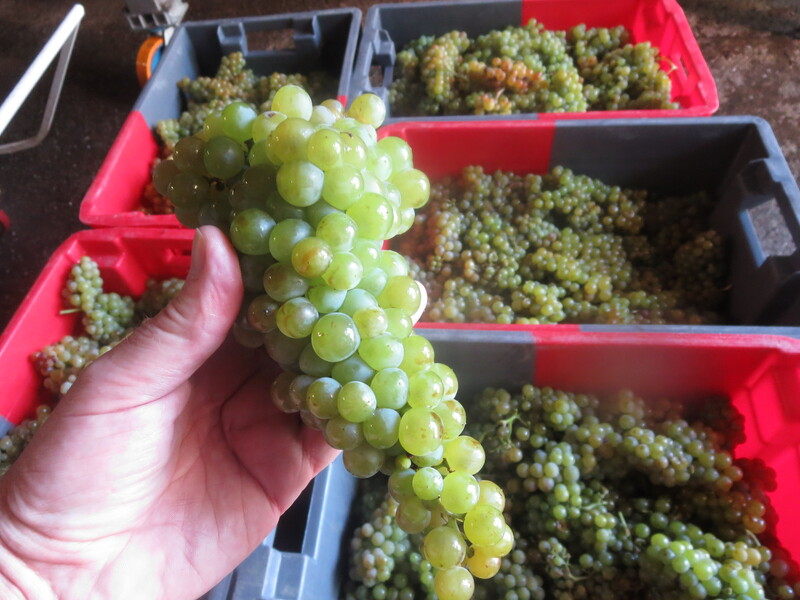 The Muscat is yellow, orange and flecked with gold and tastes very characteristic with its floral, sweet notes. They will be harvested on Friday, the Carignan in weeks to come. Meanwhile back at the cellar; cleaning, checking the equipment (the large press being serviced above) and even bottling the skin contact Carignan Blanc which James took charge of last year. James served his time here in Puimisson, learned and has just completed his first vendanges with his own wines in the Adelaide hills in Australia. Vincent’s vines in the Béarn are easing towards maturity, Julien has his vines here in the Languedoc. The team are back in Puimisson though, together with Michel and myself. And joining us this year is Ambroise from the Loire, come to learn too (in the photo with Vincent). And even Jeff will be learning as two new arrivals from Spain will mean a new form of vinification this year. They will take their place alongside the (much) smaller amphora dating back to Julius Caesar which was donated to Jeff during the winter. So we are under starter’s orders, Jeff will press the button on Thursday morning and we’ll be off. Let’s hope for a classic year. Categories: Vignerons, Vines | Tags: Carignan Blanc, Carignan Noir, Castets, Cinsault, Flower Power, Grenache, La Garrigue, Mas Coutelou, Muscat, Peilhan, Puimisson, Rome, Ste Suzanne, Syrah, Vendanges | Permalink. After a month back in the UK due to bereavement I apologise for not posting for the last two weeks. It was good to return to the Languedoc even in the midst of a midsummer heatwave. After a day’s acclimatisation I was at Jeff’s on Thursday morning, good and early. Well I thought so though he and Julien had been at work in the vines from 6am! Michel and Vincent were busy labelling some bottles of 7, Rue De La Pompe. Leon Stolarski and his wife Diane arrived to meet up with Jeff, I can reveal that Leon will be the importer of Mas Coutelou wines in the UK along with Noble Rot bar in London. I showed them the updated cellar and Jeff led us on a tasting through the 2016 wines, of which more next time. Almost as much as the people I missed the vineyards. They offer such variety, calm and beauty. The one advantage of being away for a while is to see the change over a month. The sun has seen off the wildflowers, the greenery of the vines now contrasting sharply with the parched grass. The flowers on the vines have also long gone and the grapes are now well formed and starting to swell, the size of peas. 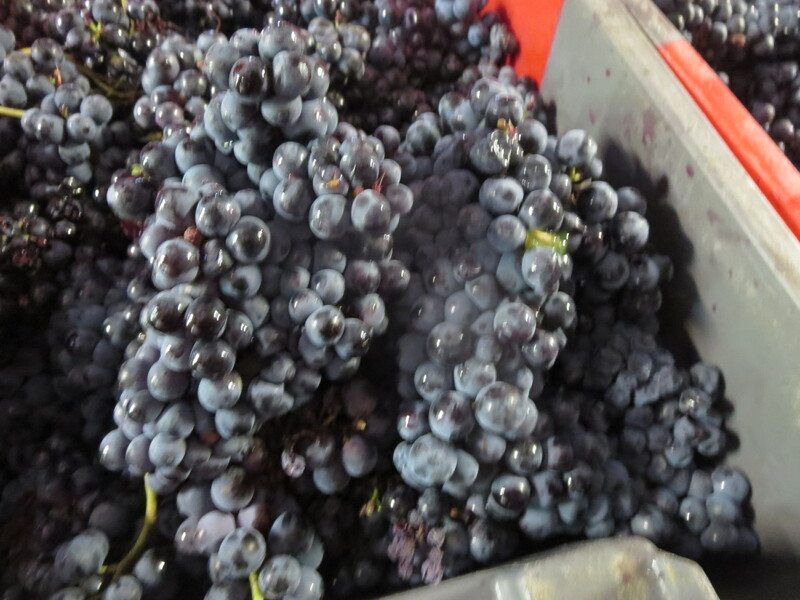 There is no sign yet of the red grapes starting to change colour (véraison). The vines look to be in very good health. The 700mm of rain through the winter, the spell of very cold weather too have helped them to rest and be strong, a vibrant green colour. The humidity of recent days brings the threat of mildew and oidium (downy and powdery mildew respectively) and Jeff has sprayed the vines with organic treatments to help them fight against the disease. The other main risk is from snails. In 2016 they ravaged Flower Power vineyard for example, reducing the harvest there to virtually nil. There is less evidence of them there this year but there are huge numbers in Peilhan and Segrairals. In the former they are covering the trees which Jeff planted around the vines a couple of years ago, feasting on the greenery amidst the parched vegetation. Nevertheless so far so good, 2017 promises to be a good vintage. Categories: Vignerons, Vines | Tags: 7 Rue De La Pompe, Carignan, Cinsault, Flower Power, Languedoc, Mas Coutelou, mildew, oidium, Peilhan, Rome, snails, vines | Permalink. After my sojourn in Alsace it was great to return to the Languedoc. Sadly I was already aware that due to a bereavement I would have to leave within a couple of days to return to the UK. However, I was able to spend one of my two days there with Jeff and amongst those vines which I had missed so much. It was a great time to be there, the vines were in full flower, many already past that stage showing the new grapes, firstly with their brown hoods and then just the green baby berry itself. The vines were looking very healthy, plentiful rain in the winter and a sharp frost in early spring had allowed the vines to rest, to gather their strength for the season ahead – a sharp contrast to 2016. Greenery aplenty, wild flowers blooming and, during my visit to Peilhan, I saw a young deer running through the vines and a pheasant. Clearly the Coutelou vines attract wildlife to its oasis amongst the surrounding desert of chemically treated soils. During the previous weeks the soils of Peilhan had been ploughed, by a horse. Gentler on the soils Jeff asked a local man to till. He himself was giving the soil a light rotivation that afternoon, turning the plants and flowers amongst the vines into the soil, a natural composting. Icare, with an injured paw, and I watched on in the sunshine. The only real problem this year has been the return of the snails. 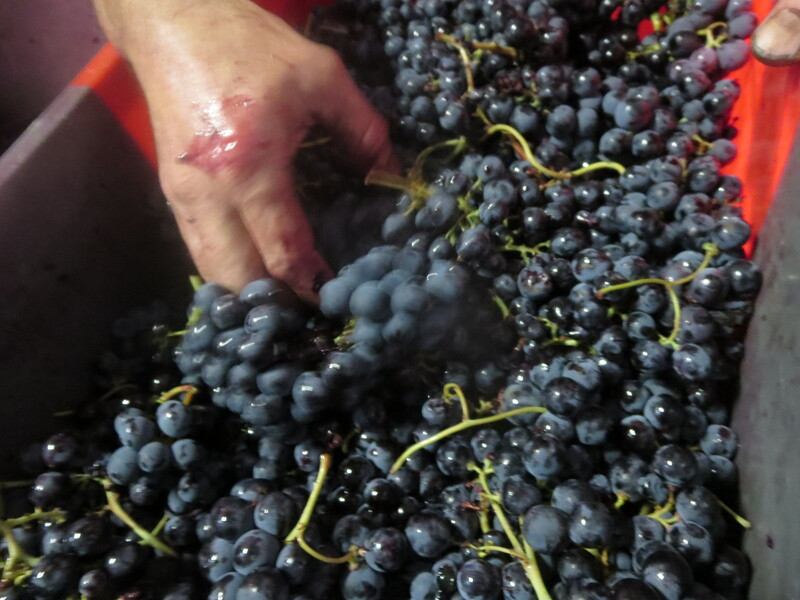 Last year they ravaged Font D’Oulette (the Flower Power vineyard) so that only a few cases of grapes could be picked. Fortunately, that vineyard has been spared this year but they are out in force in the largest vineyard, Segrairals. It was there that I also found Michel, Julien and Vincent working, tightening the wires of the palissage and removing side shoots etc from the vines. In the afternoon we tasted through the 2016 vines and, they are so different even from February when I tasted them last. 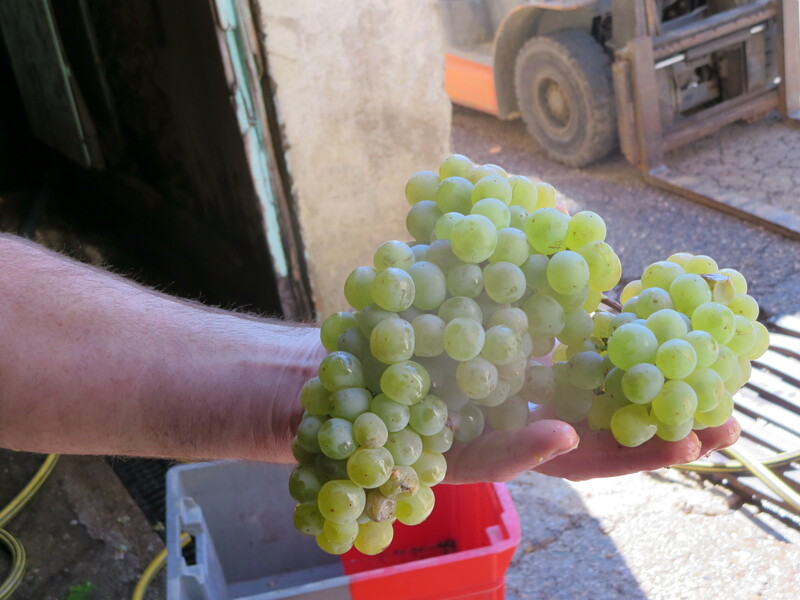 The whites are splendid, highlight a hugely successful long maceration Muscat. 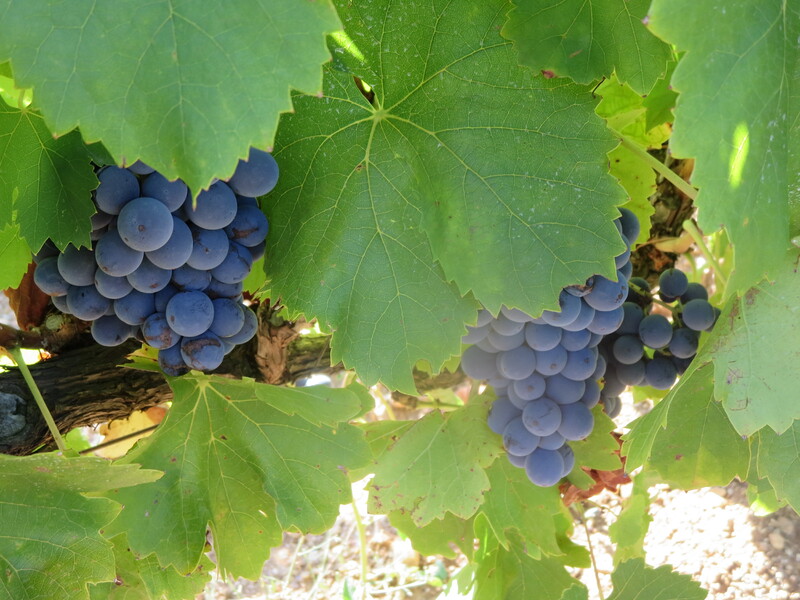 The reds such as the Carignan were very good and the top wine of the year will be the Mourvèdre, a silky, complex wine with huge depth of flavour – a treat for the short and long term. 2016 was a difficult year but Jeff has still produced some great wines. So, I look forward to getting back to Puimisson as soon as possible, to follow the vintage further and see the latest progress. There is bottling to be done and plenty more besides. The cellar is transformed, painted with the new office and floor and the stainless steel cuves plumbed in for temperature control. And perhaps, most interesting of all, there is an amphora. This is the trendy method of vinification around the world. However, very few winemakers have an amphora dating from the time of Julius Caesar with which to make wine. Jeff plans to use it this year, connecting his wine to those made 2,000 years ago. Wines with links to the past, present and future, Mas Coutelou has soul! Categories: Tasting, Vignerons, Vines, Wines | Tags: amphora, Flower Power, Font D'Oulette, Jeff Coutelou, Mas Coutelou, Mourvedre, Muscat, Peilhan, Puimisson, Segrairals, Vine flower | Permalink. After almost three months away it is good to be back in the Languedoc, and especially to be back in Puimisson, the home of Mas Coutelou. Jeff and Icare greeted us warmly and it didn’t take me long to get back into the vines. Carole and Julien were hard at work pruning in Rome vineyard, my favourite of all, I was happy to see them all. Fortunately, the day I was there (24th January) was a lovely, sunny afternoon and quite warm but recent weeks have seen freezing temperatures overnight and pruning on such mornings is brutal. However, it is vital work. 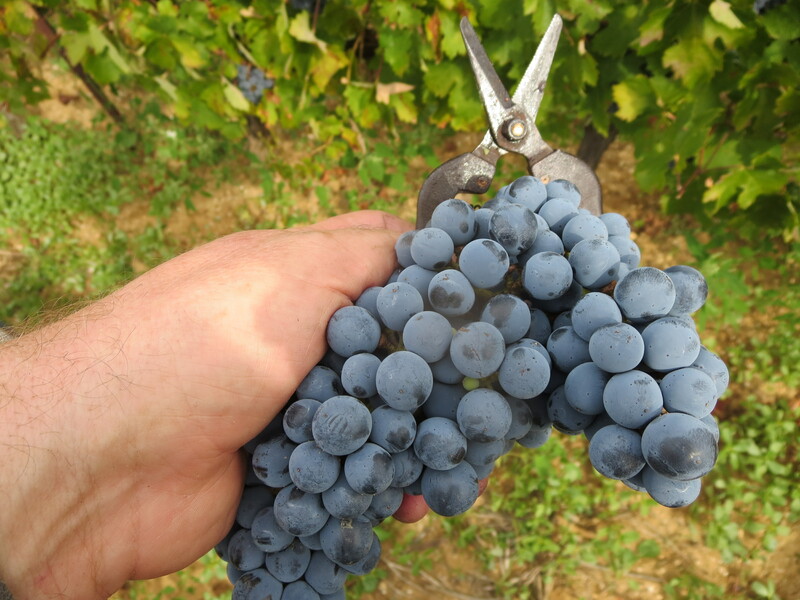 The vine needs to be trained for the season to come, cutting away dead wood and restricting the growth of the vine so that it is does not overproduce which would reduce the quality of the wine. Pruning also offers the opportunity to check the health of each vine and to identify vines which need to be replaced. The vine is studied, first cuts remove the growth of last year and then decisions made about which branches to remove and which to leave as spurs, which direction the growth will take and, also, about which spurs might be prepared for the following year too. All with freezing fingers and aching back. Much work had already been done but much remains ahead. In the photos below the Grenache of Sainte Suzanne has been pruned but the Syrah remains to be done. Similarly, the reds of Peilhan are pruned but the white parcel remains to do. Work has also begun on preparing a parcel next to Sainte Suzanne which has remained fallow for a few years giving recovery to the soil. Known as Théresette this parcel will be planted with Aramon (Noir and Gris) which is what used to be planted in this parcel many years ago and which was well suited to the soil. The ‘new ‘ parcel under preparation. La Garrigue in the background. The winter also offers the chance to see the bare vineyards and their topography. When people talk about the value of a particular parcel or vineyard it is easy to overlook how even within a small area there are variations of slope and gradient which would alter drainage and exposition to the sun. Vines are all different even within a parcel and the pruning process treats each vine on its own merits to help it to produce the best fruit it can. The vineyard soils are covered in white this January, not with snow, not here in the Languedoc at least. The white flowers of wild rocket form a spectacular blanket contrasting with the stark wood of the vines themselves. Even in winter there is something special and beautiful about being in this place, a march in the vines is so fulfilling. Categories: Vignerons, Vines | Tags: Aramon, La Garrigue, La taille, Mas Coutelou, Peilhan, pruning, Puimisson, Sainte Suzanne, taille, Théresette | Permalink. Thursday, August 11th was the last day before Jeff shut up shop for a few days as he does every year to celebrate the Béziers Féria. A few days of rest and recuperation before the preparations really start for the vendanges. As he had received a number of requests for visits Jeff decided to group them all together and have a tour of the vines and tasting with lunch. Visitors from Grenoble, Orléans and Nanterre assembled at the cave along with my friend and sommelier Sandra Martinez and we set off around some of the vineyards. Jeff explained his philosophy and vineyard work and it’s worth repeating a couple of points of note. I mentioned the problem of vers de la grappe a few weeks ago which Jeff treated with a spraying of clay to discourage the moth from laying its eggs. We found a bunch in La Garrigue which was affected and Jeff opened it up to reveal the cocoon of the larvae. He also explained how bats are the ideal solution and why he provides shelters, each bat would eat around 2,000 insects a day including the moths responsible for vers de la grappe. We also looked around at the majority of vineyards and their dark green colour at a time when the vine is putting its resources into the grapes to get them to maturity, as that is how they reproduce. So, in a natural state the leaves start to look pale and tired as the vine is not channelling energy into the leaves. The dark green, attractive vines are so coloured because of the nitrogen feeds and, in some cases, irrigation. We returned to the domaine where we were joined by a group of wine professionals. In the garden we tasted a range of Mas Coutelou wines as well as some lovely salads and (for the carnivores) some charcuterie. I missed the Bibonades and Peilhan as I was getting the Maccabeu from tank. I had a bottle of Peilhan at home recently though and it was lovely, really strong evidence of the quality of 2015. All apples and pears and fresh acidity with a long finish. Even by Coutelou standards it is an exceptional wine. The Maccabeu is, if anything, even better. Cooked apple and cinnamon flavours, fresh acidity, almost smoky. There is so much going on here and, as the jug I collected the wine in was in front of me, I kept being drawn back to it through lunch. The wine changed and opened out with more fruit and spice. This will develop beautifully when it is bottled, a stunner, my new favourite. OW1 is Jeff’s first skin contact wine. He was reluctant to join the trend and didn’t want an orange wine but this spent plenty of time on skins, I remember Cameron and I carrying out a manual pigeage. Now bottled the wine has texture and tannins from that skin contact but there is plenty of fruit and remains balanced and fresh. Very good. 5SO was on good form. The boisterous, chatty group became quiet for the first time, captured by its fruit profile and drinkability on a hot summer’s day, which essentially is what it was designed to do. Citerne was one I didn’t have last week and it had been some time since I had tasted it. It showed well, the Mourvedre adding a real plummy depth. Another wine which will emerge in coming months, another to look forward to. OPPVDQ was on great form, another to quieten the crowd. It confirmed my opinion that this is a wine which will really benefit from some time in bottle, hang on to some if you have them. La Buvette À Paulette was last week’s big surprise and another bottle confirmed the pleasure, really showing its quality. Flower Power not yet properly labelled. What a colour! Flower Power took some time to come around but now that it has done so I can confirm that this will strengthen the reputation which it earned in its first vintage in 2014. The vineyard is still young and will continue to improve the wine it delivers, if the snails leave it alone. The ten grape varieties give a complex story of light and shade, red and dark fruits, floral and sappy. Flambadou was once again a star, showing the lightness of touch in this Carignan. Jeff describes it as like a Pinot Noir. There is depth and character packed into quite a light structure. The vineyard has a light layer of limestone beneath the fine clay and it is this limestone which adds the complexity to the wine. 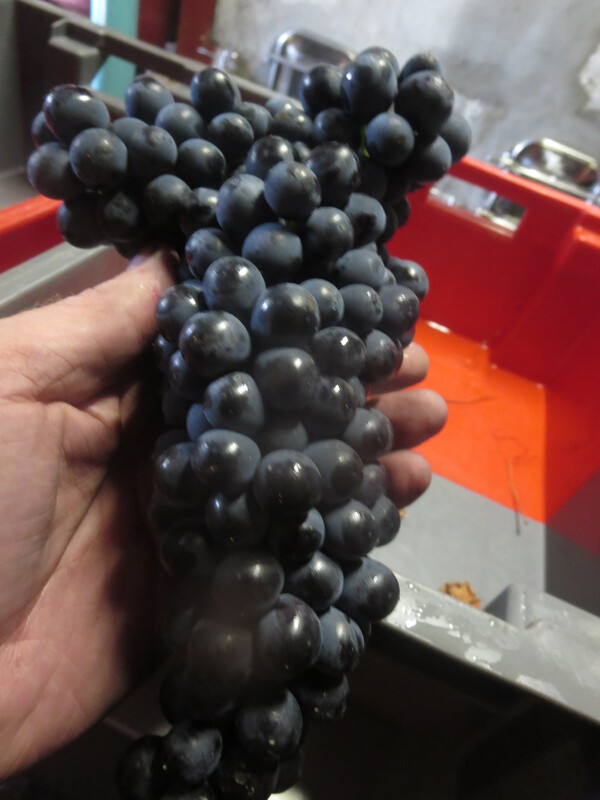 A grand cru of Carignan. L’Oublié and its story once again captured the imagination of everyone, its secondary flavours beguiling the tastebuds. Devigne Qui Vient Diner is the wine which Jeff made in partnership with Christian Venier from the Loire, Gamay added to some Languedoc grapes such as Cinsault. My, this has improved with a few months in bottle (magnum), really delivering a rounder more harmonious blend with zappy fruit and lovely sweet fruit. Finally 5J the Grenache Gris from 2012 aged in barrel made to reflect a Spanish fino to accompany the best hams. Oxidised notes, barrique notes and a flash of clean fruit, quince and apple. A great day, much longer than most were expecting but nobody showed any signs of fatigue or willingness to depart. Many joined us in the cave des soleras to taste some of the old wines there. And poignantly, some wine of Jean-Claude on what would have been his 80th birthday. His legacy will live on. I enjoyed reading the Facebook post of one of the visitors Benoit who described Jeff as a magician and an artist. The day was a success. Categories: Tasting, Uncategorized | Tags: 5J, 5SO Simple, Bibonade, Classe, Devigne Qui Vient Diner, Flambadou, Flower Power, L'Oublié, La Buvette A Paulette, Maccabeu, Mas Coutelou, On Peut Pas Vraiment Dire Que, OW1, Peilhan, Peilhan Blanc, Sauvé De La Citerne, vers de la grappe | Permalink.